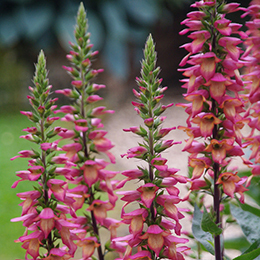 Three varieties of sturdy vertical flowering spikes of rose-pink or ruby-red tipped flowers. This “Foxglove with lipstick” series is one of the most talked-about and exciting new products to hit the market in years. Download the Digiplexis product spotlight for variety and cultural information.